Playing everything from folk, country, tejano, rock, r&b, western swing to jazz David McMillan is a musical product of his hometown, Fort Worth, Texas. He has worked with many local bands and artists including; Stone Country, Roanoke, Delbert McClinton, Brent Van Sickle, Sound Express and Robert Allen and Chicken Lips to name a few. Though David has worked with many artists, his most enjoyable gigs were with Wynn Stewart, Tony Booth and Reba McEntire. Starting out as a guitarist then a bass player, David played different styles of music in many different bands. Then he bought a pedal steel guitar. Before he even learned how to tune it or have a lesson he got a gig. 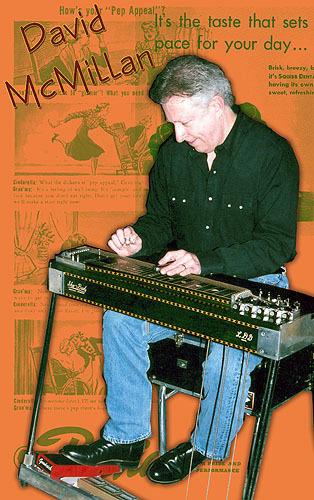 After about 3 months steel guitarist Tommy Spurlock taught him how to tune his steel guitar and strongly suggested that he should buy a volume pedal and take some lessons. David spent the next 4 years working in the house band, Sound Express, at the notorious Iron Gate Club. That band recorded several successful records and had a weekly radio show on KJIM. After a short stint with Roanoke, David spent the next 5 years with Sammy Vaughn and the Cowtown Strings. After turning down gigs with several Nashville artists David formed Brazos with former members of the Cowtown Strings. They bought a bus and a sound system and hit the road. The Cowtown Strings and Brazos opened concerts for such artists as The Judds, George Jones, Eddie Rabbit, Tammy Wynette, The James Cotton Blues Band, Hank Williams Jr., Johnny Paycheck, and Asleep At The Wheel to name a few. After 4 years on the road with Brazos, David got a day job at the Modern Art Museum of Fort Worth. That’s where he met Jim and Susan Colegrove. In 1998 they began working on some recordings in their spare time. The following year Jeff Gutcheon joined them to add his keyboard stylings to the mix and Lost Country® was formed. David has played on several recordings of other artists on Cool Groove Records. He’s done the Larry Stone CDs, The Jim Colegrove instrumental record, and the CD by Men of Extinction.